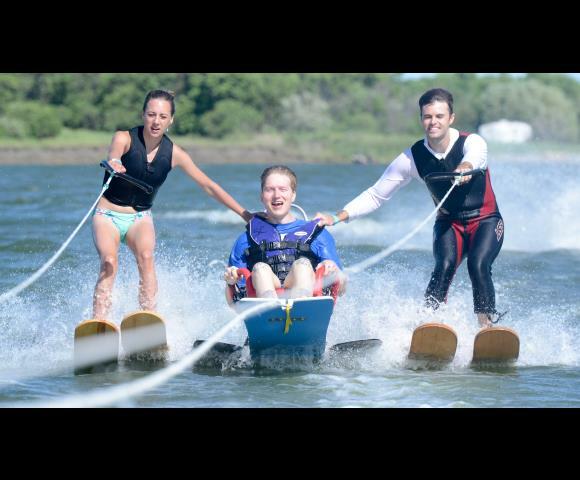 NDAD's annual Escape to the Lake adaptive water recreation event provides adults and children with physical disabilities the opportunity to water ski, take a pontoon ride and enjoy a recreational summer day on a North Dakota lake. The 25th Escape to the Lake event is scheduled for Sat., June 15, 2019. For more information and to register, contact NDAD at (800) 532-NDAD (-6323) or email lstastny@ndad.org. Download a .PDF copy of the 2019 Escape to the Lake poster HERE. Escape to the Lake is held at Nelson Lake, near Center, a town in Oliver County, northwest of Bismarck and Mandan. Nelson Lake's water is safely heated by the nearby power plant, thus enabling a more comfortable experience for those participants who may have varying physical challenges. The event is open to anyone with a physical disability who is a resident of North Dakota or one of its bordering communities in a surrounding state. Each year, between 30 and 60 individuals with disabilities participate in Escape to the Lake, with family members, friends and other caregivers along for the fun. During the June 16, 2018, event, 21 people with disabilities skied during an event that offered intermittent showers and was interrupted by thunderstorms before the otherwise fun event concluded. Additional on-site support came from organizer NDAD and area groups such as Sporting Chance and the Aberdeen (S.D.) Aqua Addicts ski team, which performs an acrobatic performance ski show when conditions permit. Past volunteers also have come from other locations across the state. Participants enjoy a complimentary lunch as well as the camaraderie and friendships that develop during the day or renew from past events. The other major 2018 Escape on-site participant was Texas Adaptive Aquatics, which helped NDAD bring the event to North Dakota in the early 1990s. Additional event sponsorship or support in 2018 was provided by a third longtime sponsor, Revolutions Power Sports of Grand Forks. Others who lent their support: CircuitGizmos of Mandan, Cass County Electric Cooperative Foundation's Operation Round Up, Northern Plains Electric Cooperative's Operation Round Up, McLean Electric Cooperative, Prairie Patriot of Mandan, Midco Foundation, Southgate Casino Bar and Grill of Grand Forks, Pub 21 of Bismarck, Pepsi-Cola Bottling of Mandan, and Coca-Cola Bottling High Country of Bismarck. An Escape to the Lake 2016 skier gets help from two Aberdeen (S.D.) Aqua Addicts side skiers on June 18 at Nelson Lake near Center, N.D.